RICHMOND, Va. (Saturday, June 29, 2002) - It was another late-race pass for a thrilling victory for Sam Hornish Jr., and one that many would say later was his greatest victory in the No. 4 Panther car. Hornish Jr. earned his third victory of the 2002 IndyCar Series season by passing Gil de Ferran with two laps remaining to win the SunTrust Indy Challenge at Richmond International Raceway. Hornish passed de Ferran - who led 168 of the 250 laps - with an inside move entering Turn 1 on Lap 249. Hornish then cruised to a 1.8323-second victory over de Ferran, as the last two laps were the only he led all night. "The other guys pulled away from me a little bit at the beginning, but then they started wearing off their tires a little bit and just overheated," Hornish said. "This is awesome for my confidence and for all of our confidence. We all love racing, and we all love being a part of the IRL. It's just a real joy to come out here and race." Said de Ferran: "The car was very good at the beginning. Then it just kept getting looser and looser and looser and looser. Right at the end there, we were really struggling with a lot of oversteer for the last 40 laps or so. "We could hang on to stay on the track, but unfortunately I couldn't hang on to Sam. He had a good run coming off of (Turn) 4. Aside from running him into the grass, which I probably shouldn't do, there was no way to keep him behind." Hornish's victory, combined with an 17th-place finish by points leader Helio Castroneves, tightened the points race considerably. Castroneves leads Marlboro Team Penske teammate de Ferran, 280-277, with Hornish third at 256. Defending champion Hornish averaged 99.124 mph in an attrition-filled race slowed by eight caution periods for 94 laps. He earned $111,550 for his sixth career victory. Hornish set up his dash to victory by passing Giaffone for second on Lap 247 with a low move in Turn 1 identical to the one he used two laps later to pass de Ferran's No. 6 car. "We came off Turn 4 better than anybody else," Hornish said. "Ever since we went green right there at the end, I knew the car was fast. It was a matter of timing." 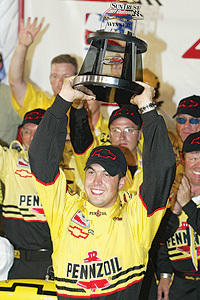 The victory came just one day after Hornish crashed his No. 4 car during practice, forcing the Panther crew to scramble to make repairs before qualifying. "It's a tribute to the team," Hornish said. "I put the car in the wall before qualifying yesterday. The guys did an awesome job putting the car back together. "We took our time, and we weren't fast for about the first 200 laps, just biding our time. We made changes to the car. The Pennzoil Panther team is awesome." Two-time Indianapolis 500 winner Castroneves was the first of many drivers to find trouble on the tricky ¾-mile oval. He did a half-spin exiting Turn 2 on Lap 8 while chasing leader de Ferran, and the right side of his No. 3 Marlboro car hit the inside retaining wall. After extensive repairs, Castroneves returned to the race on Lap 156 and ended up 17th, 147 laps down. "I had a little understeer," Castroneves said. "I started losing it a little bit. I thought I had it under control. I guess not." Seven drivers were sidelined by crashes during racing in tight quarters at RIR: Billy Boat, Scott Sharp, George Mack, Jon Herb, Sarah Fisher, Eddie Cheever Jr. and Laurent Redon. Each were eliminated in separate accidents except for Cheever and Redon, who crashed together on Lap 182 to trigger the final caution period of the race. Redon was the only driver injured, suffering minor fractures to two fingertips on his left hand. Defending event champion Buddy Lazier was sidelined in a scary pit fire on Lap 91 triggered by a fire in the rear of his No. 91 Coors Light/Life Fitness/Tae-Bo/Delta Faucet Dallara/Chevrolet/Firestone. Neither Lazier nor any crew members or officials were hurt in the fire.